What we eat greatly influences our personal health and the environment we all share. Recent analyses have highlighted the likely dual health and environmental benefits of reducing the fraction of animal-sourced foods in our diets. Here, we couple for the first time, to our knowledge, a region-specific global health model based on dietary and weight-related risk factors with emissions accounting and economic valuation modules to quantify the linked health and environmental consequences of dietary changes. We find that the impacts of dietary changes toward less meat and more plant-based diets vary greatly among regions. The largest absolute environmental and health benefits result from diet shifts in developing countries whereas Western high-income and middle-income countries gain most in per capita terms. Transitioning toward more plant-based diets that are in line with standard dietary guidelines could reduce global mortality by 6–10% and food-related greenhouse gas emissions by 29–70% compared with a reference scenario in 2050. We find that the monetized value of the improvements in health would be comparable with, or exceed, the value of the environmental benefits although the exact valuation method used considerably affects the estimated amounts. Overall, we estimate the economic benefits of improving diets to be 1–31 trillion US dollars, which is equivalent to 0.4–13% of global gross domestic product (GDP) in 2050. However, significant changes in the global food system would be necessary for regional diets to match the dietary patterns studied here. The food system is responsible for more than a quarter of all greenhouse gas emissions while unhealthy diets and high body weight are among the greatest contributors to premature mortality. Our study provides a comparative analysis of the health and climate change benefits of global dietary changes for all major world regions. We project that health and climate change benefits will both be greater the lower the fraction of animal-sourced foods in our diets. Three quarters of all benefits occur in developing countries although the per capita impacts of dietary change would be greatest in developed countries. The monetized value of health improvements could be comparable with, and possibly larger than, the environmental benefits of the avoided damages from climate change. 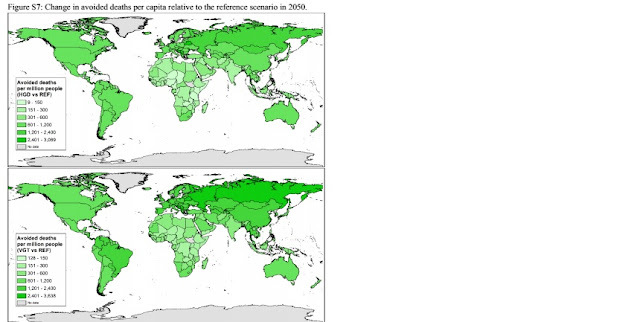 Economic valuation of the health and environmental benefits of dietary change compared with a reference scenario for the year 2050. The three nonreference scenarios are as follows: one based on global guidelines on healthy eating and energy intake (HGD) and two based on vegetarian and vegan dietary patterns (VGT and VGN). (Left) The value of environmental benefits derived from estimates of the social cost of carbon (SCC) and the value of healthcare benefits based on estimates of the costs of illness (CoI), including direct healthcare costs and total costs, which also include indirect costs associated with unpaid informal care and productivity losses from lost labor time. (Right) The value of health benefits associated with the willingness to pay for mortality reductions based on the value of statistical life and life-year (VSL and VSLY). The uncertainty intervals for the environmental valuation stem from different SCC values in 2050 [71 US dollars per ton of CO2 (71 USD/tCO2); 27–221 USD/tCO2], and the uncertainty intervals for the health valuation stem from high and low values of the costs of illness (±30%) and the VSL (±50%). This article contains supporting information online at www.pnas.org/lookup/suppl/doi:10.1073/pnas.1523119113/-/DCSupplemental.